Charla Nash, who survived a brutal attack by a chimpanzee in 2009, appeared in Washington D.C. last week to appeal directly to lawmakers and the public in an effort to gain support for legislation that would crack down on keeping nonhuman primates as pets. The legislation she's supporting, the Captive Primate Safety Act, would make it harder for people to keep chimpanzees and other monkeys by amending the Lacey Act to add nonhuman primates to the list of animals who can't be bought or moved across state lines as pets. Supporters hope that it will not only protect the public from another incident like Nash's, but that it will also protect the welfare of nonhuman primates who suffer in the hands of owners who can't meet the needs of these highly intelligent and social animals. They also hope that it will prevent primates who become too large or difficult to handle from being kept in isolation, dumped or from ending up back in the exotic animal trade. 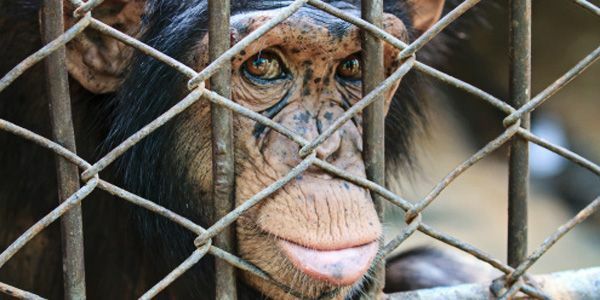 Please sign the petition urging your representative to support this common-sense piece of legislation that will protect both the public and welfare of nonhuman primates. As someone who is concerned with animal welfare and public safety, I am writing to urge you to support the Captive Primate Safety Act (S. 1463/H.R. 2856), which would make it harder to keep nonhuman primates as pets. Not only do chimpanzees and other nonhuman primates pose a serious threat to public safety, but keeping them as pets poses serious problems for their welfare – from being torn from their mothers as infants and suffering from mutilations, such as having their teeth removed, to being kept in conditions that don't meet the needs of these highly intelligent and social animals. While there are a patchwork of state laws and regulations dealing with primates as pets, people can still get them online, at auctions and from out-of-state dealers, which animal advocates believe makes federal legislation necessary to cover the gaps. This legislation would amend the Lacey Act to add nonhuman primates to the list of animals who can't be bought or moved across state lines as pets, similar to the Captive Wildlife Safety Act, which bans the interstate commerce of lions and other big cats as pets, and is supported by numerous animal advocacy organizations. I sincerely hope you will support this common-sense legislation, which will keep both the public and nonhuman primates safer.